These are very rarely called Blue-Winged Duns. 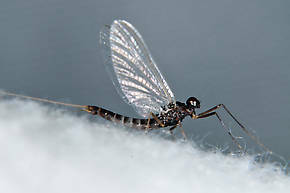 There are many species in this genus of mayflies, and some of them produce excellent hatches. 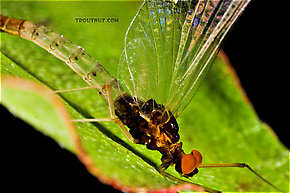 Commonly known as Blue Quills or Mahogany Duns, they include some of the first mayflies to hatch in the Spring and some of the last to finish in the Fall. "The Paraleptophlebia hatches are the seasonal Waterloo of most anglers, for without fine tippets and tiny flies an empty basket is assured." Paraleptophlebia adoptiva is by far the most important species of this genus in the two regions and is an early Spring emerger. Paraleptophlebia mollis, Paraleptophlebia guttata, and Paraleptophlebia strigula complement each other in late spring and early summer. Paraleptophlebia debilis and Paraleptophlebia praepedita occur together in the fall. 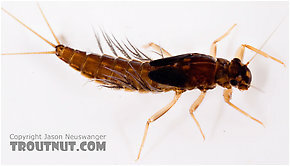 The most important species is Paraleptophlebia debilis. 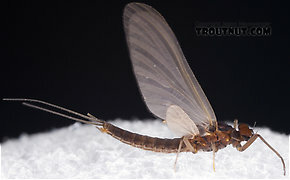 This large (for the genus) Fall emerger can be found throughout the region. It is often accompanied by one of the slightly larger tusked species. Depending on locale, this can be Paraleptophlebia bicornuta (the most common), Paraleptophlebia packii or Paraleptophlebia helena. Check out their hatch pages for distribution information. Spring is the season for the smaller Paraleptophlebia heteronea throughout most of the region with Paraleptophlebia gregalis filling this niche in California and parts of Oregon.